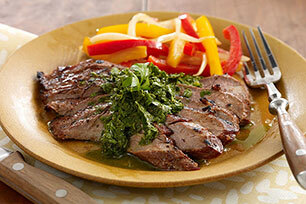 A lively combo of parsley and garlic gives juicy steak an authentic Argentinean flavor. Pour marinade over steak in shallow dish; turn to coat both sides of steak. Refrigerate 30 min. to marinate. Meanwhile, blend remaining ingredients in blender until smooth. Pour into bowl; refrigerate until ready to serve. Heat broiler. Remove steak from marinade; discard marinade. Place steak on rack of broiler pan sprayed with cooking spray. Broil, 4 inches from heat, 10 min. or until steak is medium doneness, turning after 5 min. Diagonally cut steak across the grain into thin slices. Serve with the parsley mixture. To help keep the cooked steak juicy, use tongs instead of a fork to turn the steak. In addition, score the edge of the steak by making shallow cuts every 2 inches around steak to help prevent the cooked meat from curling. Add a little heat to the chimichurri sauce by adding 1/2 tsp. crushed red pepper or a whole seeded and chopped fresh jalapeño pepper before refrigerating.